Ah, a heady trip back to the golden age of romantic comedies with an all time classic of the genre. Yes, Notting Hill, back in those glorious days of early Tony Blair-era Labour Party Britain, where you could actually conceive of both owning a house in London and operating a travel bookstore in one of it's most Bohemian neighborhoods. Will Thacker is divorced, runs a travel bookstore in Notting Hill and lives with his Welsh roommate, Spike. His fairly ordinary life is turned upside down when Hollywood Superstar Anna Scott enters his shop looking for a book on Turkey. She leaves, but Will encounters her a few minutes later and manages to spill his drink all over her. Offering his nearby house for her to change in, Anna impulsively kisses him before leaving again. She sends him a message a few days later to come see him and he does so but gets mistaken for a journalist from Horse & Hound- which I was tickled to find out was a real magazine and has to interview the rest of the cast of her new science fiction movie, which he hasn't actually seen. One thing leads to another and Anna ends up being his date for his sister's birthday party. They have a few dates but then Anna's movie star boyfriend shows up and things get awkward and Will breaks it off with her. Six months of fruitless dates in an attempt to get over her follow but, to no avail. When an upset Anna shows back up on his doorstep in an attempt to lay low following a tabloid scandal, they end up spending the night together only to have Will's roommate Spike accidentally tip the tabloids off to her location and cause a bit of an affray- and this time, it's Anna who breaks things off. More time passes (the whole 'Ain't No Sunshine When She's Gone' montage)and eventually Anna comes back to London to make a Henry James film and Will visits her on set, but hears her make a 'oh he's nobody important' remark to her costar and he leaves... Anna shows up one last time to confess her love, but Will turns her away, saying he couldn't possibly survive another break-up. He eventually realizes what an idiot he's been, runs over to her press conference and gives Horse & Hound the scoop of the year by apologizing to Anna and getting her to admit that she's going to stay in the UK indefinitely. They live happily ever, etc, etc. True Story: I fell asleep for the last part of this movie- so I missed the whole 'I'm just a girl, standing in front of a boy asking him to love her' bit, but woke up for the final dash across town- either way, it remains one of those movies that I can always sit down, watch and enjoy. 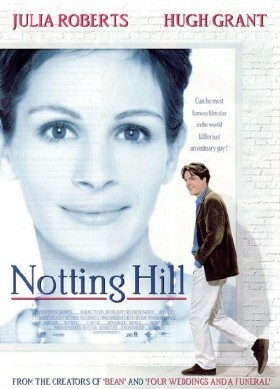 This movie represents the 90s peak of Hugh Grant and Julia Roberts' respective careers- that's not to say that both of them haven't done plenty of awesome things subsequently, but Notting Hill belongs in a rom-com Hall of Fame. it's one of the classics of the genre.